South Cotabateños here's another way to help our fellow Filipinos who were victims of super typhoon Yolanda. 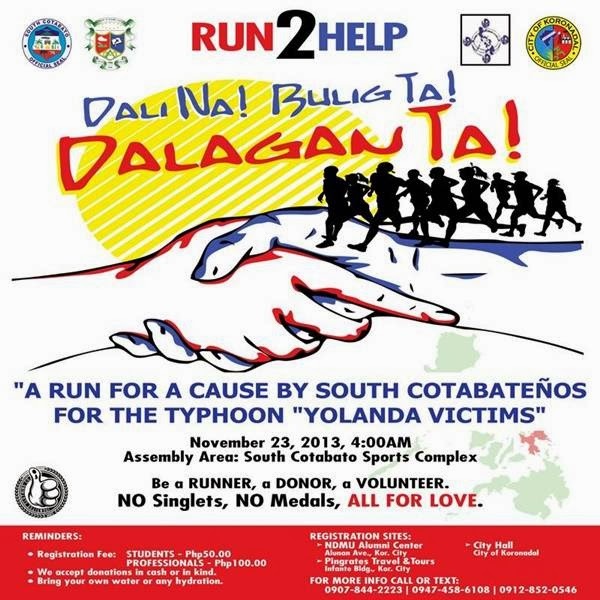 Join RUN2HELP Dali na! Bulig Ta! Dalagan Ta! - a fun run for a cause to be held this coming Saturday, November 23, 2012 in the City of Koronadal. For a registration fee of only P50.00 for students and P100.00 for professionals, we can already show that we too in this part of the country cares for survivors of ST Yolanda. You can also bring your donations in cash or in kind. In mid day of November 7, 2013 super typhoon Yolanda / Haiyan, the largest typhoon in history of the world hit Eastern Visayas and caused massive destruction. According to reports more than 3,000 were left dead, thousands still missing and more than 600,000 have been displaced. Let's do whatever we can to help. Register now!